Toilets are one of those simple household conveniences we tend to take for granted, so it befuddles us when something suddenly goes wrong. It can’t be too complicated of a problem, we think, but when we pop the top from the back of the tank we quickly realize we have no idea what we’re looking at—and no idea what to do about it when the water in the toilet keeps running and running. The good news is that continuous water flow in a toilet is usually a relatively minor problem that can be solved without the assistance of a professional. The flapper is a rubber stopper in the tank that lifts up to allow the water to drain into the toilet bowl following a flush. Over time flappers can become damaged through natural wear or from mineral deposit build-up. They develop leaks as a result, which causes water to seep continuously from the tank into the toilet. First turn off the valve in the wall behind the toilet. This cuts off the water supply, so after you flush the tank will drain without refilling. Then you are free to take a closer look at the flapper to see if it is damaged or degraded. Flappers are easy to remove and replace and your local hardware store will undoubtedly carry them. What is the lift chain? The lift chain pulls the flapper up at the flush and drops it back into place when the flush cycle is completed, allowing the tank to refill. If the lift chain is too long it has excess slack and can easily get stuck between the flapper and the pipe the flapper is supposed to plug. If this is happening you will be able to see it clearly when you lift the top off the tank. After turning off the water and draining the tank remove the chain and use a metal cutter to shorten it by two or three links. Reinstall and see if that solves the problem. If not you can cut it again but don’t shorten it so much it won’t let the flapper drop. The float valve will be either a ball that floats on the surface of the water or a cylinder-shaped object (called a concentric float valve) fixed in place on the left. Its job is to stop more water from flowing into the tank once it is filled to the proper level. If the float valve is set too high it won’t prevent the water from rising over the top of the overflow pipe. Once the water level reaches the overflow pipe it will drain out into the bowl and cannot rise any higher, meaning the float valve can’t function. Float valves are raised or lowered through the turn of a screw. If your float valve isn’t shutting off in time you can tighten the screw to push the float ball or the concentric float valve downward. Trial-and-error will let you know if you’ve moved it far enough to prevent continuous water flow. Some type of failure is occurring in the ballcock assembly, which is the unit responsible for re-filling the tank following a flush. It might be broken or just worn out. You may not be able to identify the problem just by looking at it, however. Ballcock assemblies are available in hardware stores and they come with instructions that show you how to install them. 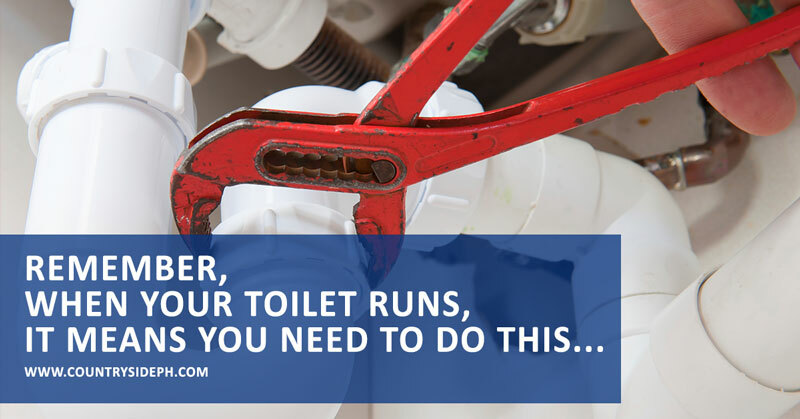 If this doesn’t solve your running water problem you should consider hiring a plumber to check your toilet more carefully. Please follow the Countryside Plumbing & Heating blog for further insights that can help you solve your plumbing and HVAC problems. https://www.countrysideph.com/wp-content/uploads/2016/01/CountrySidePH-RunningToilet-January.jpg 419 800 //countrysideph.com/wp-content/uploads/2016/11/Countrysideblue.png 2016-01-26 06:00:152016-01-26 06:00:15Why Does My Toilet Keep Running?